I was doing artic missions with my rt, by the time i was passing ls on my way to sandus. Suddenly my RT stuck in the road, and there were no any admins and mods online. So i did /cancal and /restoreall . And because I just installed this mod yesterday, i'm fear it's the bug of mod caused the stuck. Then i using my bike went to the nearest truck dept, like to take a rt test my mod in ls. But all of a sudden my bike flying to the sky. 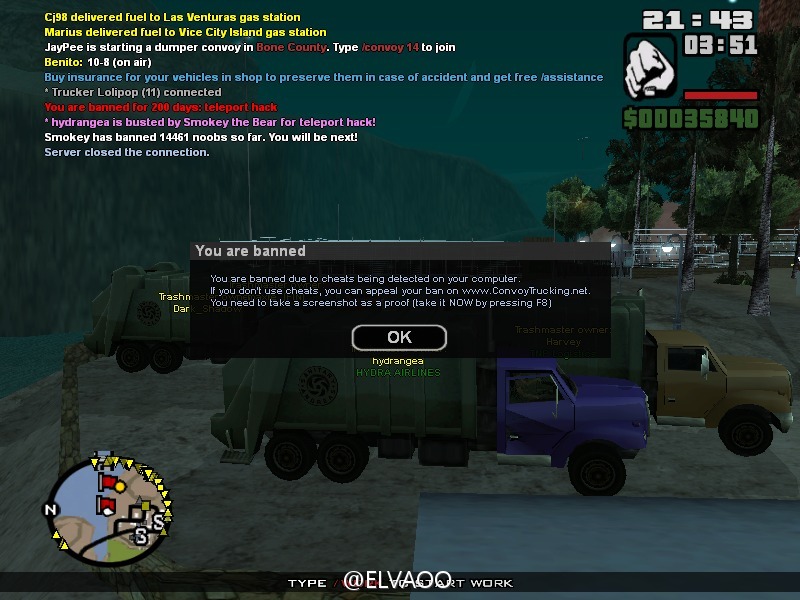 Then smokey banned me for speek hack . Sorry for my poor English. this was third times I got banned.... I just doing trash with elvaoo11.. when we finished mission at SF. we reclass at Inuvik Trucker Club for took motorbike to our trash... and then I got banned ...please unban me..
i'm doing trash with kakeshi, we had just unload at SF. i m following he up to the viaduct，then i heard crash and my car fly into the sky. i got banned. i m not I cheating but everything happened so fast, i did't know why i m flying. admin has unbanned already, but i think i‘d better post my ban appeal here.